Bill’s AT trail pass and sidekick. Redline Guide Bill Robichaud went on a long walk. 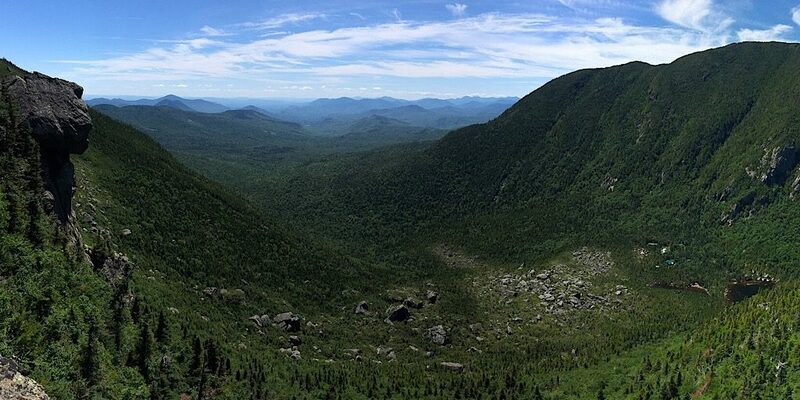 He began by hiking up a little mountain in Georgia on a hot April morning, then ending some four-and-a-half months later on Baxter Peak of Mt Katahdin in Maine. The trail? 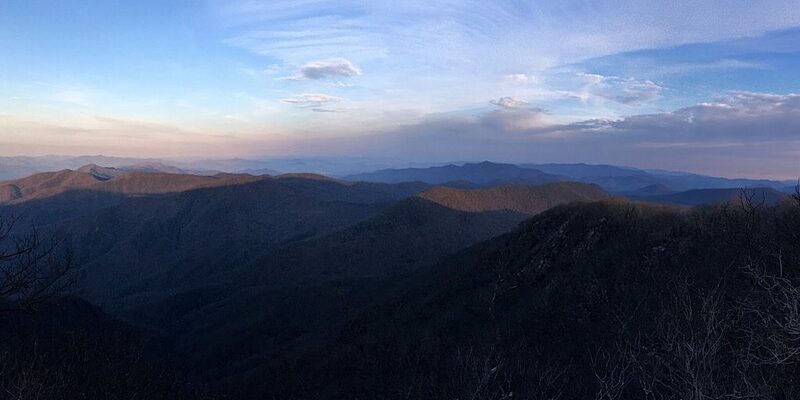 Why, it was the 2190-mile Appalachian National Scenic Trail (better known as the AT), of course. 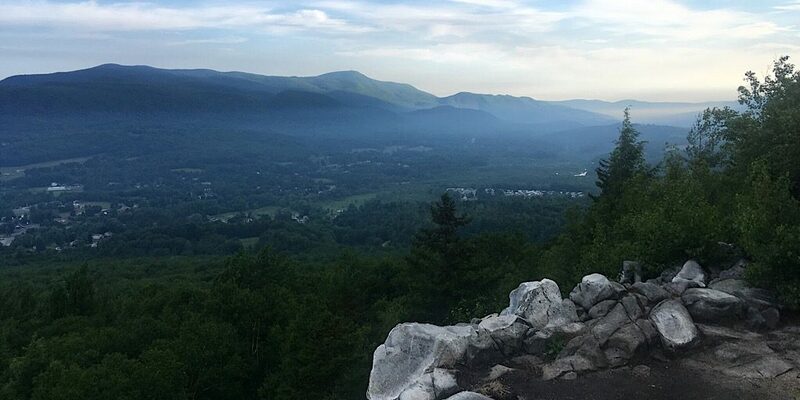 And Bill took it on — as “Science Guy” (a trailname Bill earned on Vermont’s Long Trail which he hiked with owner Mike Cherim in 2015) — from south to north, meaning he was northbound or “nobo.” It’s an awesome accomplishment. An accomplishment we want to share and celebrate, but which we’ll do in a unique and hopefully interesting way besides just saying: Congratulations Bill! Foggy going near Tray Mountain. All photos courtesy of Bill, awkward cropping by Mike. I realized, going back through all my pictures, that I didn’t take many at all in Georgia. Perhaps that’s because the weather was less than stellar, with rain, cold, and even some icing in the few days it took me to get through the state. 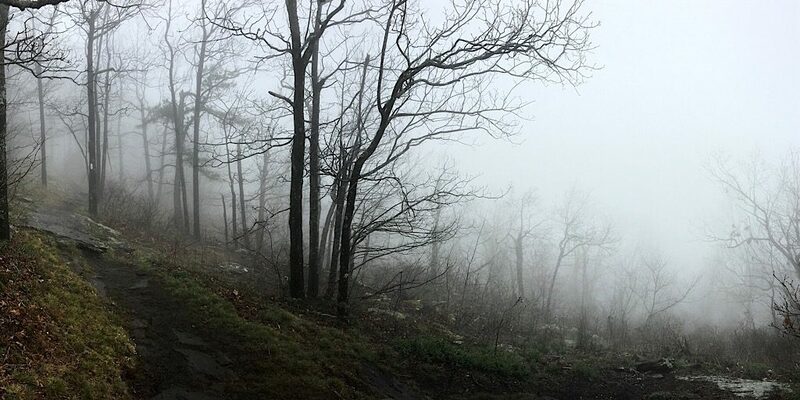 My girlfriend, Rachel, was able to join me for the first three days, which was amazing, though having to part ways wasn’t easy on a frosty, foggy, morning in Neels Gap. After our tearful goodbye, I began to get in the groove which would define the next four months; hiking, eating, sleeping, pooping, repeating. I also learned that the South isn’t flat, by any stretch of the imagination. Sunrise colors and smoke from Standing Indian Mountain. 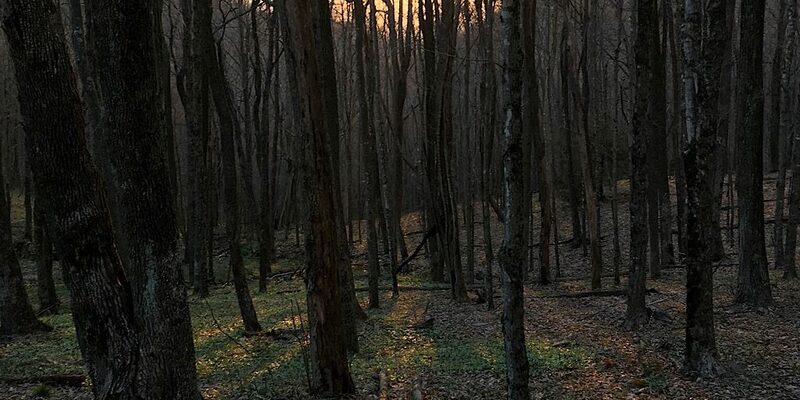 The trail in North Carolina is like a snake in its southern section, seemingly going in every direction except north, before it hits the Smokies, and straddles the border with Tennessee for quite a long while. The weather continued to be interesting, with many nights below freezing, some snow (especially at elevation), and a few doses of rain. Foliage wasn’t really a thing either, as spring had not yet sprung in the mountains of the south, and the days where it was sunny got downright hot in the trees. Sunset from near Beauty Spot Gap. Once fully in to Tennessee, the issue of backcountry (human) waste disposal reared its ugly head. You see, Tennessee has but ONE backcountry privy (toilet) along its entire section of the AT. In the Great Smoky Mountains especially, the shelters on the North Carolina side had privies, while the ones on the Tennessee side had ‘toilet areas,’ which were basically minefields. I had to suffer through a few more very cold, windy, nights, but as I neared Virginia, the nighttime temperatures started to moderate. In fact, just before I hit the border, I found myself alone for the night for the first time since starting. It was a wonderful feeling, and one that I would seek out more and more as I headed north. Clifftop views from near North Marshall Mountain, Shenandoah National Park. Boasting the longest stretch of any state, 541 miles in all, Virginia took me an entire month to traverse. Spring finally arrived, leaves burst forth from their buds, wildflowers poked up from the forest floor, and the woods started to come alive. 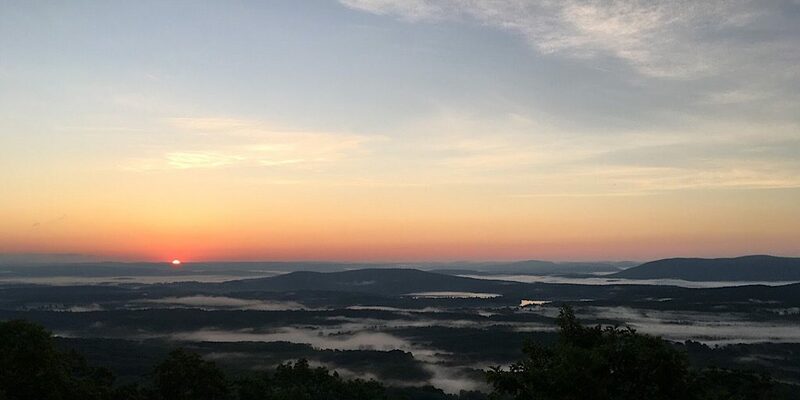 The weather continued to be a factor, with a three day stretch of rain in southern Virginia (which I dubbed Mud Luge), and a week-long bout through the Shenandoah and into West Virginia. The rain didn’t deter me from hiking, but it made for some rough days, packing up everything wet in the morning, only to set it up, no drier, at night. I still had my share of beautiful days, and even on the days it did rain, I seemed to dodge storms more often than being hit by them. People also said Virginia was flat/easy, but that was not my experience, as some of the longest sustained climbs I encountered came in this section. Rachel came to visit me in Waynesboro, it had been a hard nearly two months without seeing her, and it was a much needed morale boost. 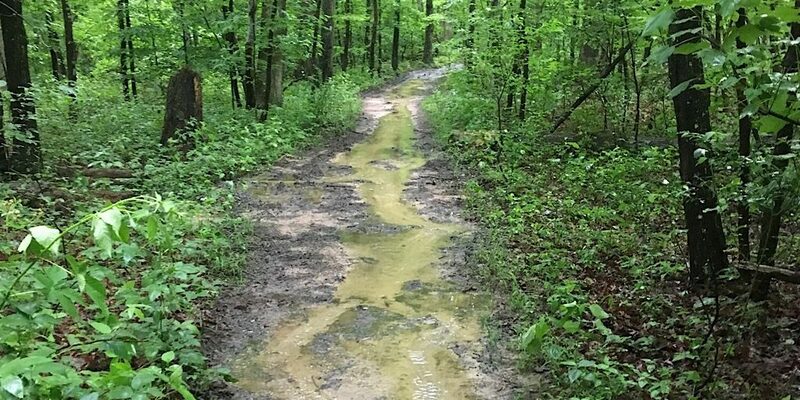 West Virginia’s [soggy] trail conditions. Going from the longest state to the shortest, was just a continuation as far as the weather was concerned, and the Shenandoah and Potomac Rivers were both above flood stage as I arrived in Harper’s Ferry, the psychological mid-point of the trail. The flooding caused a portion of the trail on the other side of the Potomac to be inundated, and therefore closed, meaning I had to walk roads to get around the flooded section. Of course this opened a couple of hours after I’d left town. It was nice to spend a day wandering around the historic downtown, which I remembered visiting as a child. 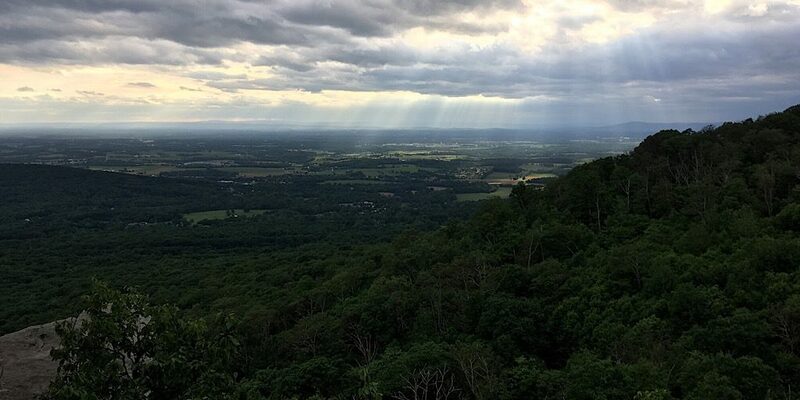 Crepuscular rays before the rain from Annapolis Rocks. The quick 40 miles of Maryland, was marked by rain the only night I stayed in state, but a gorgeous second day made up for it. The major thing I noticed was the terrain, which became rockier, and the massive amounts of graffiti on said rocks at many of the viewpoints along the way. That being said, minus the graffiti, many of the views were stellar, looking out over bucolic farmland. The terrain also eased up a lot, with mild climbs and descents, softening me up for what was to come. 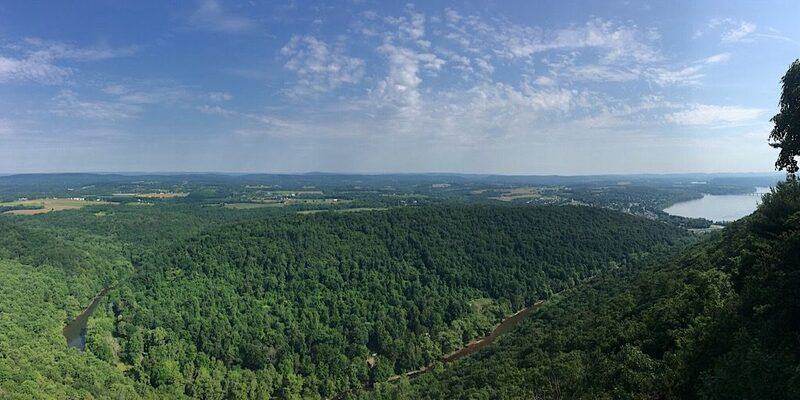 View from Hawk Rock near Duncannon, PA. They don’t call it ‘Rocksylvania’ for nothing, though it’s a bit of a misnomer for the first 150 miles or so. All of my 30+ mile days (four of them) happened here, including a 33 mile day to put me in striking distance of the NJ border. When the rocks did come, my pace slowed dramatically, even with the fairly flat ridges that the trail follows through most of the state. There was one day where 32 miles took me 12 hours, and two days later, 22 miles took me the same amount of time, the rocks were just relentless. It wasn’t uncommon to only have one major climb for the day, usually less than 1000′, then you’d be undulating along a rocky ridge for 25 miles. Heat began to be a factor too, with some really hot days thrown in, and for whatever reason, they always seemed to come on days when I was out in the open for long stretches. 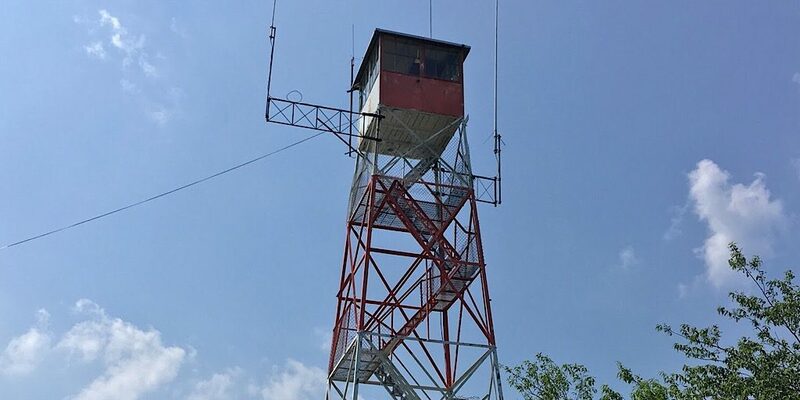 Culver Fire Tower, a mile after my snakebite. I’d heard really good things about NJ before setting foot in it, and while it was quite nice, extenuating circumstances came in to play. Nine miles in to my second day in the state, with temperatures hovering in the mid-90s and high humidity, something ‘stung’ me in the foot, as I turned up the trail to resume climbing from what turned out to not be a viewpoint. 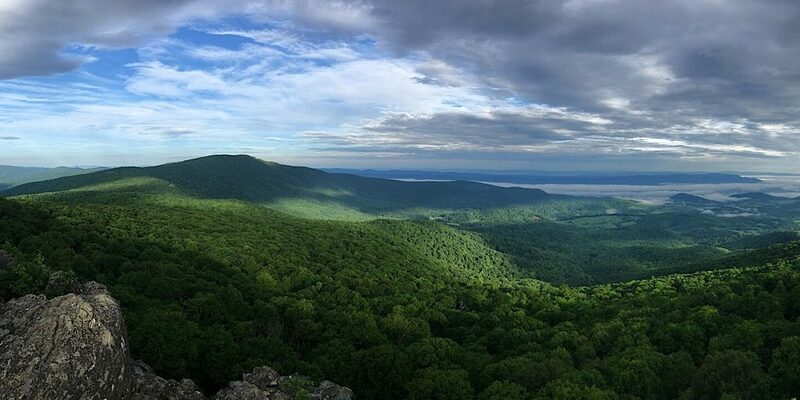 After hiking a painful mile to the Culver Fire Tower, I rested a while, and while my foot was swollen, I assumed that I’d been stung in the foot by some manner of wasp, so I kept hiking. A further 13 miles later, I reached the road, and was met by the hostel owner I’d arranged to stay with prior to being stung. Upon being assessed by her other guests, and having ice and elevation make the swelling worse, I was brought to the local emergency room, where it was determined that I’d been bitten by a Copperhead [snake], through my shoe! After being given a course of steroids, and being told to stay off it for two days, I stayed off it for one day, and hit the trail on performance enhancing drugs. Obviously now, my AT finish deserves an asterisk. 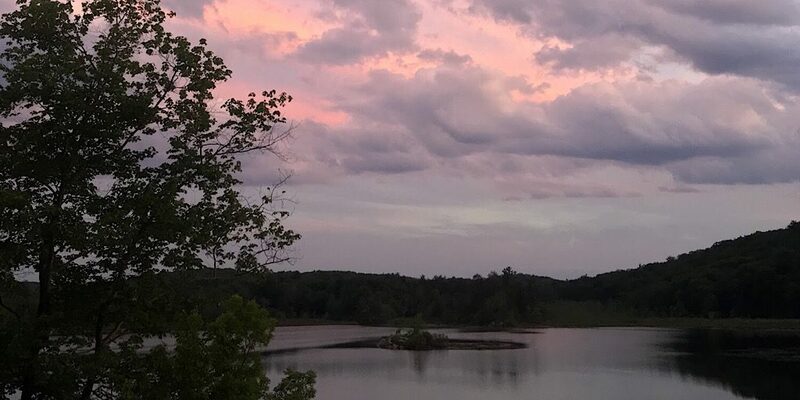 Clouds at sunset over Island Pond. Following my poisonous reptilian encounter, I got out of NJ as fast as my legs would carry me, and got beaten up by the terrain in New York. It wasn’t that the hiking was hard, it was the constant ups and down that got to me. Maybe the flatter states made me weaker? It was also the continuation of what I heard referred to as ‘deli blazing,’ which started in New Jersey (and continued in to CT), and meant that there were plentiful, convenient-to-the-trail delis, cafes, and stores to ease my burgeoning hunger. Rachel came to visit again in Fort Montgomery, to check up on me after the snakebite. It was good to see her, but harder to leave. My few days in CT were fairly pleasant, with decent going terrain-wise, though very wet for two of the nights I spent out. I ended up getting in to my tent the night I spent at Belter’s Campsite, at about 7 in the evening, after cooking in the rain, and didn’t get out until the rain had nearly stopped at 8:30 the next morning. I then walked down to the road 0.9 miles away, and took a detour to a cafe for breakfast. Later that day after 8 or so easy miles, I walked in to Salisbury, CT for lunch, avoiding a thunderstorm. Leaving town, I got to my intended campsite early enough to set up and ride out a thunderstorm in my tent, see awesome sunset colors that night, and catch the sunrise the next morning. Early morning view from Cheshire Cobble. HOT, that’s what MA was to me. There was not a day that I spent in the state, that the high wasn’t above 90°F, and that the low was much below 70°F. It was a supreme struggle to stay hydrated, especially enough to deal with the amount of sweating I was doing, and miles I was still hiking. Rachel joined me for a day out of Great Barrington, happy for the ever shorter drives to visit, but [she was] zapped by the heat. I think the only time I felt cool along the whole stretch was up on Mt. Greylock where at least elevation provided a smidge of relief. 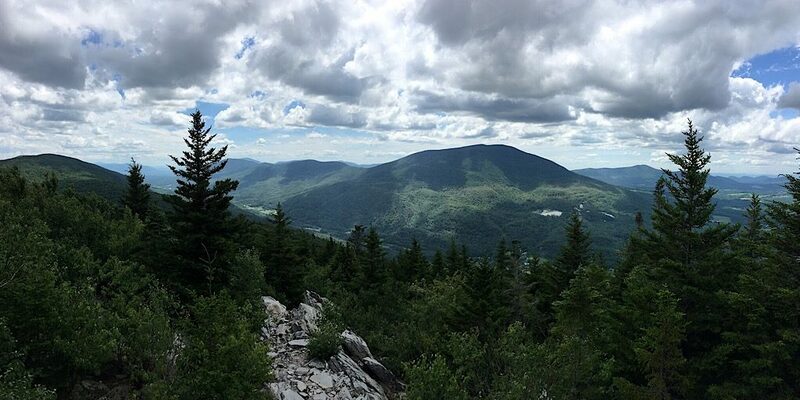 Out to the Taconic Range from Baker Peak. Finally it felt like I was home! Reaching the southern terminus of the Long Trail (at the VT/MA border) was a fantastic feeling, a moment I’d been anticipating since Georgia, knowing that I had walked all the way from there. Sadly, the heat didn’t let up, but I kept hiking anyway. It was amazing to be in familiar territory, finally knowing what I was looking at, and getting to stay at some new places along the section. Rachel joined me for two days, on the section over Killington, though badly sprained her ankle. I battled through some gastrointestinal distress on the day out of Killington, but otherwise thoroughly enjoyed the east/west section connecting to the border at the Connecticut River. Panorama of Carter Notch from Pulpit Rock. Coming home took a lot out of me, and I felt pretty shattered by the time I got there. I was brought home from Rt. 25, just south of Moosilauke, by a friend, Jake (who had joined me outside of Hanover), and didn’t get back on trail with my full pack until I was past Grafton Notch in Maine. I hit all the sections with the assistance and company of many friends, with generally good weather throughout, and stayed at home for nearly three weeks. The comfort of being there was amazing, as my body needed to rest, but I think being home for that long made me a bit soft. Maybe I should [have] backpacked the section through the Whites, for the real experience, but the pull of home being so close was real. 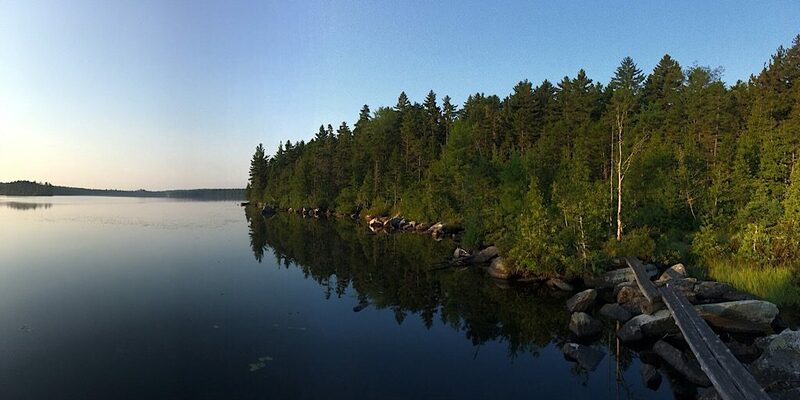 Early morning along the shore of East Carry Pond. My home state, and by far the hardest. The first day back on, north of Grafton Notch nearly took the wind out of my sails as the trail steeply climbed up, down, over, and around all the mountains that it could find. The part of ‘Southern’ Maine, as it’s known on the AT, was as tough as anything I had yet seen, and my body had gotten soft being at home, not carrying the weight every day. I also think that the Mahoosuc Notch is not the toughest section of the trail, rather it’s the Barren/Chairback Range in the 100 Mile Wilderness. Nothing quite compares to this 16 mile stretch for roughness, steepness, and beauty, but it was incomparably tough. I was so happy that Rachel was able to join me for the final days, and especially on summit day, as that meant I could go home for good. It still hasn’t hit me, as nearly two weeks have passed since my finish, and I’m not sure if/when it will. Well told, Bill. 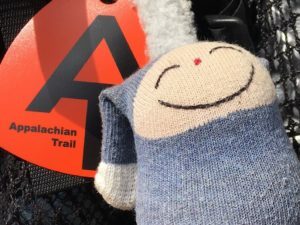 And a hearty congratulations to you for your AT thru hike!